The Guild vs. Guild system is getting a thorough rework in the upcoming final Beta. Here is what you can expect to see! As already mentioned in the May Community Q&A video, Guild vs. Guild is presently being reworked. The reasoning behind this rework is that currently, the GvG system is not only filled with placeholders, such as the scoring board, but also feels relatively flat. While the core 5 vs. 5 battle will not be changed, surrounding features will be added and altered. Let’s have a look at the changes our team is currently working on, which will be ready to be implemented this summer with the release of the final Beta. Community Manager Christoph Hombergs sits down with Game Director Robin Henkys to go over the new features and upcoming changes. Do note that this is still a work in progress, so specific details might change and interfaces shown are not finalized. No time to watch the video? Here is a written summary of what’s coming! New Cluster Lay-Out: More room for fun! Right now, multiple base territories can be found in a single cluster. That means Guilds are more often than not surrounded by their enemies, and an enormous amount of space in the cluster cannot be entered. 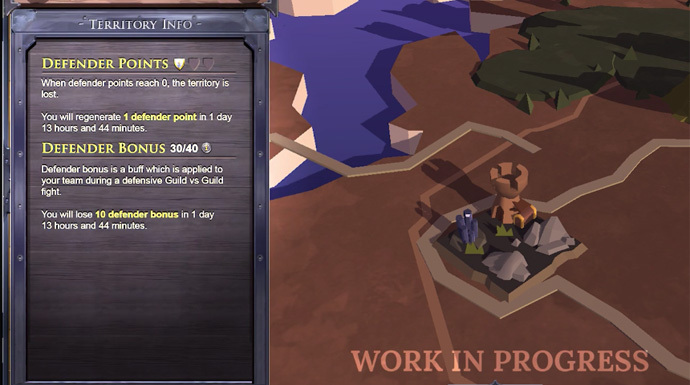 In order to give players more freedom and space per cluster, as well as give Guilds a place to truly call home, there will be only be one base territory per cluster. All resource territories, except farms, will be gone when Final Beta launches. Instead, Watch Towers will emerge. These are territories with no magical barrier, but with the ability to shoot down hostiles and with NPC guards at their side. Only when a GvG battle is ongoing will Watch Towers have a magical barrier, will they not attack anyone and will the NPC Guards be gone. These towers serve as a connectors between base territories, being a semi-safe zone and outpost in the open world. Some Watch Towers will also have farm plots on them. This new feature will be implemented to avoid having players to fight during uncomfortable hours, giving them a disadvantage. The New World will be segmented into different region, with each region having a different regional timers where Guild battles can take place. Depending on where you are from and what timezone you are in, certain Albion clusters will be more convenient for you to fight in. The regional timers will last a total of four hours every day, and Guilds can battle during that time. This means that the time in which GvG fights can happen will no longer be determined by the Guild, but by the cluster the territory is in and where that cluster is in the world. Guild battle declarations for Guilds who already own a territory, will be simplified. All GvG declarations will happen through the World Map, with territory info easily available through the map as well. Players will no longer be able to pick the timeslot they want the battle to happen, and instead the battle will automatically assigned to the first available slot. Guilds need to declare battle a minimum of 16 hours before the start of the regional timer. If the day is already fully booked, the battle will be scheduled on the next day. For those who do not own a territory, Siege Camps will still be available. However, Siege Camps will only be active during the regional timer set up for the cluster it is in and can only be used once per day. Similar to normal GvG declarations, the next available slot will be automatically picked. Additionally, Siege Camps will have a new feature: Pacify. If no one has declared an attack yet and a Guild uses the pacify function, the Siege Camp cannot be used to attack that day. To avoid so-called "fake attack" and encourage a more interactive style of GvG, two new attack modes will be added, on top of normal Guild battle: retaliation and counter attacks. Retaliation attacks allow defending Guilds who lost a Guild battle to try and take back a lost territory, if they own a neighboring territory. These attacks need to be scheduled within the time slot and can only take place if the next time slot is still open. 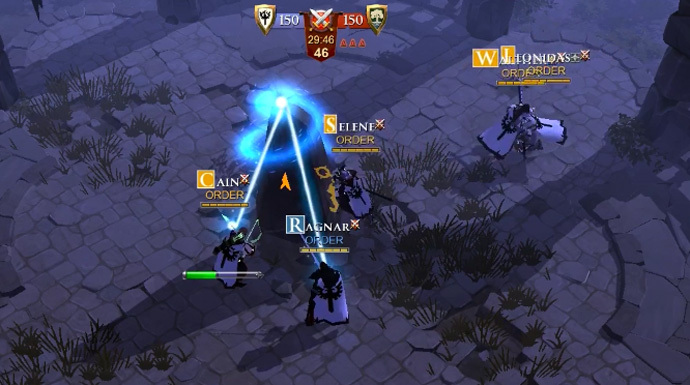 Counter attacks allow defending Guilds who won a Guild battle by a large margin, to counter-attack their enemy. If defenders win with a significant amount of match points left (with the amount depending on the territory type), a counter attack will be automatically set up to take place 30 minutes after the original attack happened or was supposed to happen. Unlike other attacks, counter attacks will not cost any silver. 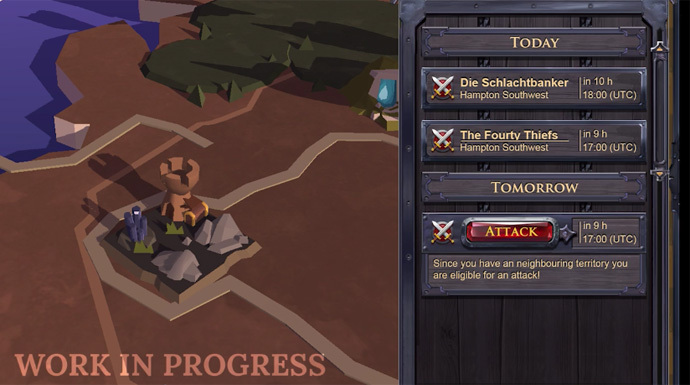 If the attacking Guild cancels their attack by losing their territory, a counter attack will still be scheduled on that territory. At the moment, a territory starts with 40 Defender Bonus, giving defender an advantage over their attacker. When a defending Guild loses, their Defender Bonus will be decreased. This is very demotivating: if you lost a battle with a 40 bonus, how are you supposed to win with less advantage? We want to change this “build down” feeling of Guild battles to a “build up” one. First of all, the raid attack option will be completely removed from the game. Secondly territories will now start with a 0 Defender Bonus. After a loss, Defender Bonus will be increased. If the territory is not attacked or is successfully defended for a longer period of time, the Defender Bonus will decrease. The minimum and maximum amount of Defender Bonus will depend on the type of territory. GvG Fight: Score UI will get a facelift. A killfeed during the fight will be shown underneath the score. Orb Capture: a new visual effect will be added to claiming an Orb in GvG. Captures will also be better highlighted on the minimap. Warcamps will clearly show the range of the tower, and have a more clear damage effect. Several GvG notification will be added, such as a countdown for the next upcoming fight. Territory claiming will become clearer, with a breakdown of all requirements. Guild territory management tab will be updated. Are you looking forward to these changes? Let us know what you think in the comments below!